Doctor Who is a programme unafraid to place hints and clues into one episode, only to have its relevance pay off further down the line. While the mystery of the leaf in Clara’s book mentioned during ‘The Bells of Saint John’ may not be the most intrinsically exciting, it gets a well-deserved payoff just one episode later in ‘The Rings of Akhaten’ as much more of the story of Clara is revealed during a rather unique and visually stunning tale. Whenever a new companion is introduced, he or she understandably gets quite a lot of screen time initially in order to flesh out the character. Clara proves no exception as a glimpse is attained of her childhood while, in the present, she is whisked away to a strange and fantastically-realised alien world where she befriends a young girl fearfully running away and hiding. In truth, this may be one of the few Doctor Who episodes where the sheer spectacle of the setting outshines the story it telling. Whether in the busy bazaar filled with multitudes of alien species or the more fantastic Rings of Akhaten themselves, the physical props and CGI are top-notch throughout and give the finest overall realisation of an alien world in quite some time. It’s not all that often that an utterly unique alien world is the main setting- more often Earth, Earthlike planets, or space ships get that honour- and it’s refreshing to remember just what types of places the universe may have to offer. The story itself focuses on the afore-mentioned girl, the Queen of Years very well portrayed by Emilia Jones, whom her community is forcing to sacrifice herself in order to satiate their god. With varying degrees of subtlety and success, the story tackles the concepts of religion and the sacrifices that go into maintaining the belief. The fear and the ritual allows for Clara to again show off her compassionate side, but ultimately the great buildup to what genuinely appears to be a supreme threatening force as the conscious planet reveals itself fizzles to a disappointing conclusion. Matt Smith gives a truly powerful speech about the need for fear in this situation, and the setting and guards certainly heighten that tension, but the defeat via leaf and music- while making total sense within the confines of the story- is underwhelming. That said, the musical component of this episode is extremely strong, and due credit to Murray Gold must be given. ‘The Rings of Akhaten,’ then is a story full of ideas and certainly isn’t afraid to slow the pacing down in order to explore the emotions and motivations of its characters. The issue is that its ideas and main story are never as fully realised as the setting itself is, and the extremely intriguing godlike being is cast aside too rapidly and too easily to leave a meaningful and lasting memory. The end result is average, the score, CGI, and propwork being the real stars of the story alongside the increasingly strong pairing of Matt Smith and Jenna-Louise Coleman who again prove their great chemistry. 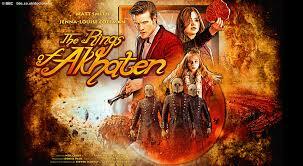 Every series needs to mix up its episodes and delivery, and ‘The Rings of Akhaten’ certainly manages to offer something unique that achieves what it sets out to do by showing Clara’s past while making her vital to the present and future during its self-contained tale.